Home » Tutorial » How To » What is Hyperfocal Focusing? With my latest reviews of the Voitlander 15mm F4.5 and the Zeiss 18mm F4.0, I’ve been talking a lot about hyperfocal focusing and zone focusing, and I guess there may be some confusion about what I mean by these terms, and how to use these techniques. I will clear up the confusion and explain what I mean by these terms. For the beginners out there, or for those of you that intrinsically understand what depth of field is, but don’t really know how to explain it, Depth of Field is the area of acceptable focus in an image. As photographers there are a couple technical tools that we can use creatively to effect the image. One is Aperture which controls Depth of Field, the other is Shutter Speed which controls motion. For aperture, the smaller the F number the larger the “hole” the larger the F number the smaller the “hole”. This starts to get confusing because it’s somewhat counter intuitive. An easy way that I teach my students to remember why aperture is important and why we use it is: “the smaller the F number the less things in focus, the larger the F number the more things in focus”. If you remember this saying then your journey as a Depth of Field master is well on its way. Definition 1: The hyperfocal distance is the closest distance at which a lens can be focused while keeping objects at infinity acceptably sharp. When the lens is focused at this distance, all objects at distances from half of the hyperfocal distance out to infinity will be acceptably sharp. How do we use this technique when making images? That is the easy part. If your lens has a Depth of Field scale on it this technique is very easy. It is use a lot by “street photographers” because you don’t need to focus the camera for every shot, you can just look through the viewfinder, compose the image, and take the picture. You sacrifice Superior sharpness for speed. As you can see in the sample images the lens barrel has a scale of distance. The black dot middle of the lens is the distance that you are currently focusing at. The numbers to the right and left of that black dot represent Apertures. 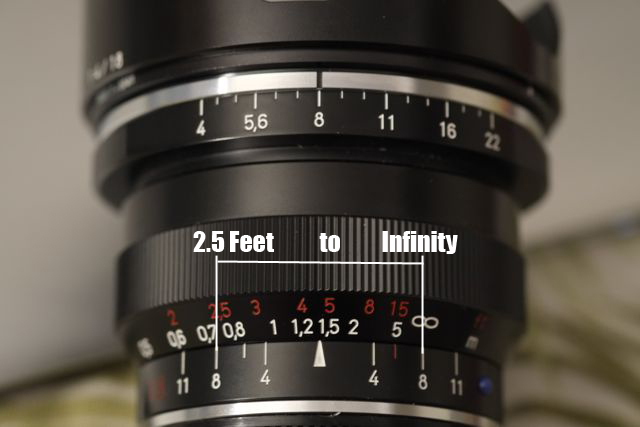 So in the example image: The current focusing point is between 2.5 feet to 4 feet. The red lines in the image represent the Hyperfocal distance which is 2 1/4 feet to infinity at an aperture of F8.0. Using the same scale if I used an aperture of F4.5 you can see that the corresponding “Zone” of focus would be 2 feet 4 inches to about 6 feet. This is what I mean when I say Zone focusing. The difference between Hyperfocal focusing and Zone Focusing is that Hyperfocal Focusing usually means a certain distance to infinity, and is most easily accomplished with wide-angle lenses. Zone focusing is a technique used mostly for certain zones with medium focal length to medium telephoto lenses. For example when I use the 35mm Zeiss F2.0 lens I can focus at around 3 feet and set my aperture to F11 and I know that everything in the “Zone” of about 2.5 feet to 4 feet will be in focus. Or I can focus at 7 feet with an aperture of F8.0 and I know that everything in the “Zone” of 5 to 15 feet with be in focus. 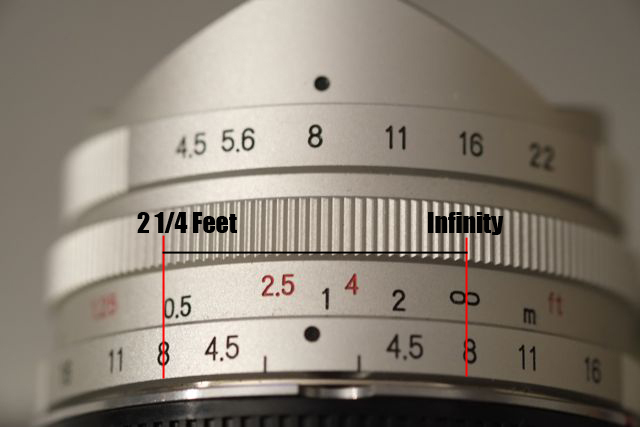 In the picture of the Voitlander 18mm F4.0 below, the Hyperfocal technique would be to focus at 4.5 feet, use an aperture of F8.0 and have a hyperfocal distance of 2.5 feet to Infinity. With the same lens focused at 4.5 feet, and the aperture set at F4.0, you have a “Zone” focus of 3 feet to 8 feet. The techniques of Hyperfocal focusing and Zone focusing are very power techniques that all photographers should at least know about. Depending on your shooting style you may or may not use these techniques on a daily basis but knowing about how the techniques are used will give you a new tool in your photography tool belt that you’ll have when you need it. Don’t dismiss these techniques because you’re not a “Street Shooter”, the same principles are used for all types of photography such as food and product photography. Large format photography, Architecture, Fine Arts. You can use these techniques in all styles of photography. Your autofocus not getting you the results you want when photographing your kids? Use Zone focus and chase those little guys and gals around. Trying to capture your pets in motion? Same thing, the uses are endless! As you practice these techniques more and more, you will start to get very good at judging distances, which for a photographer is an indispensable tool. Go and practice these techniques and if you have any questions feel free to contact me and I’ll be happy to help. Happy Image Making!! What do you think of this technique and the quality of your images? Use the comments and let me know! I’ve been using both the hyperfocal and zone focusing techniques ever since picking up a Leica M9. Although I originally picked up a new Summicron-M 50mm f/2 with the M9, I’ve been loving my copy of a Voigtländer NOKTON Classic MC 35mm f/1,4. 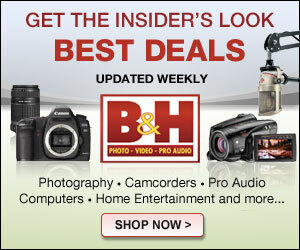 It’s a whole lot less expensive than an equivalent Leica and it is pretty darn small and light. Would be interesting to see how well that lens would work on a NEX. Linh Pham, Thanks so much for your comment and participation!! How do you like the hyperfocal focusing and zone focusing technique?? Thanks so much for your suggestion, I’ll try to get my hands on the Voigtlander 35mm F1.4. I’ve heard many great things about this lens and want to test it for myself. Compared to the Zeiss, do you think the Voitlander is a much better buy? Voitlander is a half stop brighter, Cost less seems more compact?? If the optics are up to par, seems like on paper the Voitlander is a better deal? I’ve found the zone focusing technique extremely useful when I walk around and want to focus more on framing than focusing. I’m not perfect at it as sometimes I underestimate the distance to the object. I used the hyperfocal focusing technique when I decided to use my Leica to take pictures at a soccer match. It let me spend more time on watching the game and be able to instantly snap pictures as needed. The Voigtländer NOKTON 35mm is not only a classic optic formula, but also lends a hint of a classic look. If you are looking for something to be sharp wide open and care about distortion, the Zeiss would be a bit more to your liking. Once you stop down to f/4-5.6 on the NOKTON, it is pretty darn good, even when you pixel peep. I haven’t been bothered by the barrel distortion as I kind of work around it. I could have picked up the Zeiss, but I do like having that extra 1/2 stop and it just feels right on a Leica. About the Voitlander 35mm, by your descriptions it sounds like the Voiglander Nokton 35mm F1.4 may be like the Zeiss 50mm F1.5. The Zeiss 50mm has a great old school style bokeh, circular focus area and non modern lens formula. I love it for portraits. How bad is the distortion of the Nokton 35mm? Is it mostly on the edges? Maybe with a crop body the distortion may be even more minimized? Your thoughts? You’ll see that the mantle itself exhibits some barrel distortion. In my usage, the distortion is slightly noticeable as I usually try to keep large straight lines from running through the top or bottom of the frame while in landscape mode. If I’m looking for a more precise shot, I’ll try to use my ‘cron 50mm when I can. Granted, you can adjust a lot of it out through LR or DxO Optics. While researching lenses for a Leica kit, I had considered getting that Zeiss lens, but was considered about the focus shift. Now that I’ve kind of learned how to deal with it, I would have waited to get the Zeiss 50mm 1.5 instead of the ‘cron 50mm. Linh, Thanks again for your insights. Interesting to hear how well you adapted to the lens. The Zeiss 50mm over the 50mm cron? Just for money sake or what? I love the 50mm Zeiss, just curious your reasoning behind that statement? While cost would be one of the reasons, but I like the more classic look and color rendering of the Zeiss a little bit more. On the flip side, I don’t know if I would like the slightly larger size and viewfinder blockage. You say ‘Depth of Field is the area of acceptable focus in an image’ but I have to take exception to this. DOF is really the area of acceptable OUT OF FOCUS in an image. Gene Lowingerq, Thanks so much for your comment. I respect your opinion and understand why you may feel this way. I have heard it said this way before. I guess it depends on how you look at it. I tell my students that there is a lot of information out there on the internet, that it’s easy to get confused about what the real “true” answer is. In photographic terms there is the “Science” or Fact, and there is the interpretation of all that technical speak. Photographers and are usually visual people so the way they interpret “technical” definitions may vary greatly. The main thing I tell them “and it may not be technically correct” is however you can remember what the definition of a certain term such as Depth of Field is, and as long as they can apply that definition in their mind to an image then I won’t argue over semantics. Basically “however you need to remember it as long as you know what it is, and “use it correctly”, then you’re good”. That being said. The reason I define Depth of Field as the area of acceptable focus as opposed to the area of acceptable out of focus is that, In photography we have terms called “Shallow Focus” or “Shallow Depth of Field” and “Long Depth of Field” or “Deep Focus”. There are many names for the same terms. When we are talking about these terms we’re not talking about the area out of focus we’re talking about the “area in focus”. For example if we break down the term “shallow depth of field” what is “shallow” in the image? the area out of focus or in focus? When I think of a “shallow depth of field” image I think of an image with a lot of out of focus content and very minimal in focus, correct? So by the generally accepted definition of shallow, we must be talking about the “in focus” area not the out of focus area. Same is true for the terms “Long Depth of Field”. When we use terms such as “long” what are we talking about? the out of focus area? Or in focus area? Some people may understand Depth of Field better in your terms and some people in my terms. The main thing that’s important though, is that we remember and apply the way we remember things in our images, and have “intent” for using these tools and techniques. Don’t use F1.4 when you’re trying to feature a stadium full of cheering fans, and don’t use F22 when trying to isolate a single flower from a bouquet. My 2 Cents. Happy Image Making! Please comeback for more articles and How To’s.